Iasi County Council and the Association for the Promotion of the Knowledge Economy (APEC) are taking active steps to promote business opportunities in Iasi, Romania through a Business Forum to be held in Tel Aviv, on June 10th, 2014. 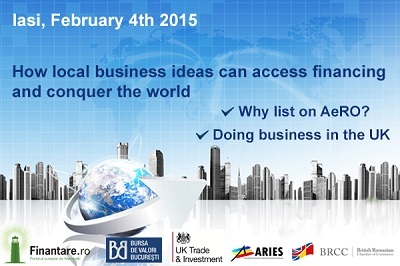 More than 100 entrepreneurs from Israel and Iasi, Romania will attend the event. This first foray into business content aims to create a network of relevant stakeholders from the business, academia, and administration of the two countries. 100 entrepreneurs from Israel and Iasi will tackle challenges to develop concrete partnerships in areas of mutual interest in agriculture, pharmaceuticals, ICT and research & innovation. The forum will be held at the Manufacturers Association of Israel (29, Hamered St, Tel Aviv – 16th floor), on Tuesday, June 10th, 2014, starting at 09.00 a.m.
“Transportation, health, education and industrial parks will benefit from a 300 million EUR boost as part the Iasi County Council’s short and medium term economic strategy. Other hundreds of million will come shortly from European funds to support additional projects. Two industrial and one agro-industrial parks will begin operations soon, so the local government comes towards friends in Israel with resources which would be the basis of a long term collaboration”, said Cristian ADOMNIȚEI, President of Iasi County Council. “During the meeting we will present investment opportunities in Iasi, ways of supporting co-financing of European investments. It is a project for the local community, but with direct impact on business”, said Marius Alexa, President of APEC. Joint Venture Opportunities in Iasi, Romania is a complex project started this year that will continue in other major world capitals, with direct air connections from Iasi Airport (Vienna – September 2014, Rome, London – 2015) in order to meet the business environment expectations and attract investments in the most important urban center at the Eastern border of the EU. The following have confirmed participation at the Joint Venture Opportunities in Iasi, Romania Forum: H.E. Andreea Păstârnac (Ambassador of Romania in Israel), Mr. Eli Lev (European Department of the Ministry of Foreign Affairs, Israel), Mrs. Sima Amir (Manufactures Association of Israel), Colette Avital (Chamber of Commerce and Industry Israel-Romania), as well as Iasi County Council representatives, academia and the business environment in Israel and Romania. The event is organized by the Association for the Promotion of the Knowledge Economy and Iasi County Council, with the support of the Romanian Embassy in Israel, Chamber of Commerce and Industry Israel – Romania, Manufactures Association of Israel, The Israel Export & International Cooperation Institute, Tel Aviv & Central Israel Chamber of Commerce, Israel Association of Electronics & Software Industries, Science and Technology Park Tehnopolis Iasi, Enterprise Europe Network, Arhipelago. More information about the agenda, speakers and the Forum Joint Venture Opportunities in Iasi, Romania, can be found at www.investiniasi.ro, www.events.finantare.ro. Iasi County is situated in North-Eastern Romania and has an area of ​​5476 km2, and a population of approximately 800.000 inhabitants. The city of Iasi is a well-known university center with over 40,000 students, within the four state universities delivering study programs in medicine, economics, IT, agriculture, architecture or theater. The GDP per capita in 2013 was 5,400 EUR, a third higher than that GDP of the North-Eastern region of Romania. What connects Iaşi and its people to the Israeli people? The history of the Jews from Eastern Europe has a fundamental place in Iaşi, the largest centre of Romanian Jews in the 19th century and the first half of the 20th century. Romania was, in the interwar period, the fourth country in the world as country of the Jews, after Russia, USA and Poland. And the Jews were for Iaşi the most powerful civilisation and development engine. The historical premises are our landmarks for today. In Iaşi, in this place that the Jews found a friendly haven, the first Yiddish newspaper in the world was established (1855) and also the first Jewish theatre in the world (1876), was founded by Master Avraham Goldfaden. Almost half of the people in Iaşi, before World War I, were Jews. At the end of 1930s, this city had almost 130 synagogues, a unique situation in Europe. Many Jewish people of culture who were born or lived in Iaşi remained in the history of this place. Iaşi is today, par excellence, a city with impressively numerous places reminding of the Jewish civilisation. The oldest synagogue in Romania can be found in Iaşi, and many other landmarks are waiting for you to discover their past, meaning and beauty. Today, as a sign of appreciation of the lesson taught by the past and the memory of the Jewish community, Iași County Council, at the initiative of Mr. President Cristian Adomniței, decided to make in Iaşi the first memorial of the Holocaust victims outside Bucureşti, as well as a memorial museum. This will be built in a historical place, of outstanding institutional and memorial significance. Dezbatere Conferinta Finantare.ro Cluj: Care sunt principalele provocari pe parcursul implementarii proiectelor cu finantare europeana? Dezbatere Conferinta Finantare.ro Cluj: Ce tehnici si instrumente de MP te pot ajuta atunci cand pregatesti o investitie? Conferinţa Finanţare.ro, forumul naţional de finanţări europene, management de proiect şi investiţii, devenit un cadru suport pentru creşterea ratei de absorbţie a fondurilor europene în România, a avut loc pe 7 iunie, la Iaşi. În cadrul conferinţei, s-au aflat faţă în faţă specialişti în domeniul finanţărilor şi consultanţi în managementul proiectelor cu peste 150 de reprezentanţi ai organizaţiilor, companiilor şi instituţiilor direct interesate de instrumentele disponibile pentru implementarea şi dezvoltarea proiectelor lor. Conferinta Finantare.ro Iasi 2011	Comments Off on A doua editie a Conferintei Finantare.ro s-a incheiat! 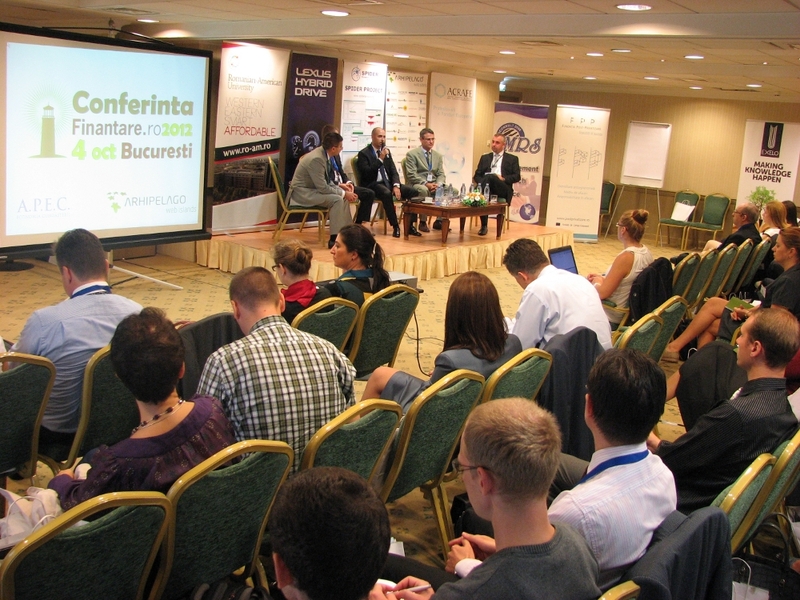 Vineri, 4 iunie 2010, a avut loc la Iasi: Conferinta Finantare.ro – Forumul regional de finantari europene, management de proiect si investitii, un eveniment ce a reunit 40 de speakeri, 3 moderatori, peste 160 de participanti, 20 de organizatori, 110 masini in parcarea, 3 etaje amenajate corespunzator, 6 sali dotate pentru sustinerea workshopurilor si conferintelor, un targ expozitional cu 30 de standuri, o sala de intalniri de afaceri si interviuri, o lansare de carte a unui trainer international, 200 litri de limonada, 100 de platouri cu preparate speciale, o fantana de ciocolata, frigarui de fructe, sampanie si peste 35 de premii acordate participantilor in cadrul tombolei.